Two expansions in one! A 7 tile expansion for Carcassonne and a 5 tile expansion for Hunters & Gatherers. King and Scout is not a complete game, but must be played with Carcassonne. As I explained in my [thread=686627]review[/thread] of [thing=18836][/thing] Carcassonne was the very first ‘Gamers Game’ I got to know. The board of our local youth club went on a weekend to plan the activities for the following year and after the hard work a friend threw Carcassonne on the table and explained it to us. I was sold from that moment on 🙂 . Actually, I liked it so much I actually bought it a few weeks later and after I got to know it a little better I started exploring the expansions like this one. How did I get to know this game? I saw it on the counter in a small gaming shop called ‘Red Dragon Games’ in Antwerp (mainly Warhammer) right around the corner of our gaming club. It was appealing and cheap so I picked up a copy, as well as [thing=18836][/thing] and [thing=12903][/thing]. The theme doesn’t change, but now the king is looking for the biggest city / castle and robbers roam along the roads. game consisting of 7 tiles (5 new playing tiles with all new combinations, a ‘king’ and a ‘robber’ for scoring extra points) and one for the spin off [thing=4390][/thing] consisting of 5 tiles. Right now I’ll only talk about the first one since I’ve never played the second one ;). People that played [thing=13][/thing] once or twice will recognize this. The 5 playing tiles are mixed with the other tiles. The first player to build a city receives the ‘king’ tile. When another player builds a larger city, that player will steal the ‘king’ tile away and so will every next player that builds a larger city. The same goes for the ‘robber’ tile, only this happens when a long or longer road is built. The player in posession of the ‘king’ tile receives 1 extra point per finished city at the end of the game. The players in posession of the ‘robber’ tile will receive 1 extra point for every finished road at the end of the game. So how do you win again? As in the basic game, you still win by having most points at the end of the game. Maybe a little one: You’ll have to keep track of what currently are the largest city and the longest road. Usually we do this by putting a spare meeple or another marker on a small improvised track. So what exactly do I think about this expansion? – It only holds a small amount of tiles. – The rules can easily be applied without the expansion. – If you only have one of the basic games, the other half of the expansion is quite useless. – It looks nice. The scoring tiles I mean. – There are 5 new tiles that offer some new possibilities. – If you do have both basic games it’s a nice 2-for-1. Just check out the pictures of the tiles, maybe try the rules out and decide for yourself whether you’d spend the money on it or not. The king and The Baron give the core game just a little boost of variety, since they tend to be a little boost of points if you happen to have one of them in your power. The extra 7 tiles are really great since they shown a rare mix of the 3 elements of the game (farm, castle, road). An example of one of them is a tile that looks like a shuriken. If you ever happen to stumble across this expansion and it’s below 7 or 5 dlls, don’t hesitate on grabbing it. This mini-expansion add some new tile for Carcassonne and a couple new rules for the biggest castle and the longest road. You can apply the rules without buying the expansion. For Carcassonne collectors only. 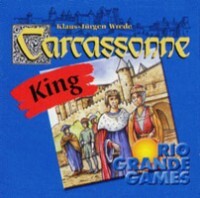 Add a Review for "Carcassonne: King and Scout"